As we are constantly looking for ways to help our customers–even the ones who drink too much on occasion–we thought we’d poll our team for the worst morning-after stories and we discovered that the worst hangovers typically accompany a loss of one of three items—your phone, your wallet/purse and, of course, your keys. This holy trinity proves once and for all that not all hangovers are created equal. Sometimes the worst hangovers can’t be cured with coffee and a metric ton of water. As we love to do around here, we turned to technology for solutions and discovered most of these disasters can be easily avoided. If you have ever fallen victim to a hangover disaster, or want to prevent one in the future, this one’s for you. These days, we are all constantly tethered to our phones. They are the lifeline tying us to all the most important people in our lives. There is something about losing that connection that can instill a sense of extreme panic. So the most important thing to do when you discover you have lost your phone is to remain calm. Thousands of years of human existence have come and gone without the use of mobile phones, and you too will survive. The first thing you’ll want to do is call the people you were with or the bar you were at to see if they have any insight into your problem. If you are with a friend, see if you can use their phone. If you are alone and you don’t have a home phone (because, let’s face it, who does anymore?) you can use one of many free phone platforms out there from your laptop or desktop computer. The easiest is Google Hangouts. Visit hangouts.google.com and press Call to dial any US number. Many people don’t know that the iPhone has a tracker built in. It is called Find My iPhone. If you have this enabled on your iPhone (it is enabled by default so unless you turned it off, you should), you can get a map of your phone’s location by visiting icloud.com/find. Here, you will log in with your Apple ID to access a map and find your iPhone. 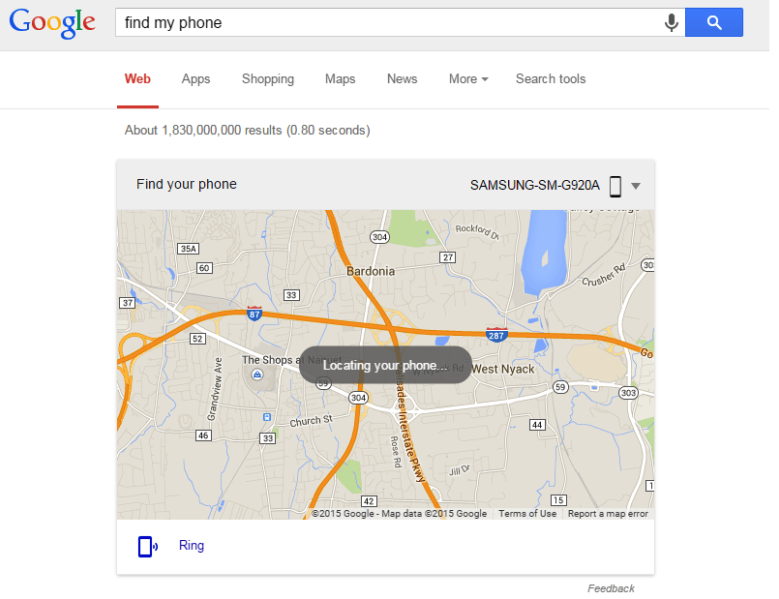 Google Android offers a similar feature with the Android Device Manager. If you have this enabled (which, again, you should unless you turned it off), you can do a Google search using phrases like “where is my phone?” or “find my phone” and it will show you a map where you can find your phone. You can also make the phone ring remotely. Cool, huh? Oh Google, what will you think of next? In all of their infinite wisdom, the scholars of the Internet have repeatedly declared that the first step when you lose your wallet or purse is to cancel your credit cards. The only problem with this is when your wallet is not really stolen, but lost somewhere easily accessible. Maybe it is in your pants pocket from last night. Maybe it is in the cushions of the couch. Maybe it fell under the bed. Make sure you rule out all obvious solutions first before you call your bank. The next step should, indeed, be cancelling all your credit and debit cards and checking the accounts for any fraudulent charges. But remember, once you do this, your card will no longer work and you will be without remote access to your money until they mail you a new card. So make sure your bank is open and you can get money if you need it before cancelling. Some cards have what is called a Freeze or Security Hold, where you can temporarily suspend card activity while you search. Wells Fargo, Capital One and Discover all offer this. With Discover, you can even freeze card activity from your phone with the push of a button. Call your card issuer to see if they offer this as an option. While credit card companies have strong protections against unlawful charges, and typically offer reimbursement, a lost wallet opens you up to a larger problem: identity theft. One way to protect against this is to report the loss of your wallet to authorities. That way, you can show your insurance company and credit card companies you are taking the proper precautions. This police report allows card companies to investigate bogus charges on your behalf and protects against thieves using other sensitive info, like your social security or driver’s license number. Lastly, make sure you report any identification loss—passport, social security number, driver’s license—to the DMV. If you open your wallet to discover your credit or debit card missing, don’t panic. 9 times out of 10, you left it behind the bar. Call the bar where you were and see if they have it. If they don’t, follow the instructions above to make sure you protect yourself against theft. Want to avoid leaving your card behind next time? Try setting an alarm in your phone for when the bar closes or when you expect to leave. Make sure the alert sound is loud and the note is in all caps. Lots of exclamation points. You are not alone. 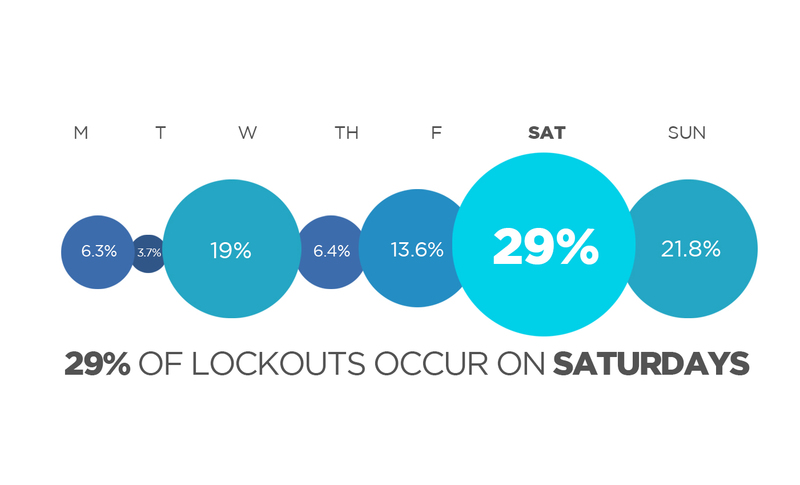 Our research shows that the majority of lockouts occur on Saturdays after a rough Friday night! It can happen to the best of us…your keys fall out of your jacket, you get home, reach in your pocket and…nothing. Panic sets in. You bang on the door of your house hoping to wake your girlfriend or one of your roommates so you don’t have to sleep on the porch. Morning comes and you are still one key short of whole. What do you do? The first step is to get a key made. Find the closest spare key you can and get yourself to…well, where do you go to find a key duplication solution these days? KeyMe’s key duplication kiosks offer a fast, convenient and simple way to copy your keys so you can get back to normal. KeyMe kiosks can copy brass keys for a few bucks in under 30 seconds. Just search for one in your search engine or our app and you should see the one closest to you. But what if your roommates are not around? What if your girlfriend is non-existent? You can still get yourself a key. Simply get your roommates, your mom or whoever has a spare to download the KeyMe app, scan their key to the digital keychain and share it with you. When they do, you can log into your account via the kiosk and print your key straight from the digital scan. The future is now! As you can see, a bit of clever technology could have prevented all these disasters. It’s a big, tough, unkind world for the forgetful. But a little pre-planning and a functioning app store account can mean the difference between a fun night and some tears in your beer. Good luck out there!